" Exclusive: Ellsberg Disagrees With WikiLeaks' Assange on Whether Clinton Should Resign	"
Daniel Ellsberg, the legendary "Pentagon Papers" whistleblower, is an ardent supporter of the WikiLeaks project and of its co-founder Julian Assange, who finds himself under attack from many corners. The man whom Secretary of State Henry Kissinger once called "the most dangerous man in America" recently traveled to London to appear at a press conference with the besieged Australian in support of his release of some 400,000 classified Iraq War logs. But, as Ellsberg revealed during my interview with him on Wednesday, he disagrees with Assange on at least one point in regard to the latest round of documents released by the controversial organization. 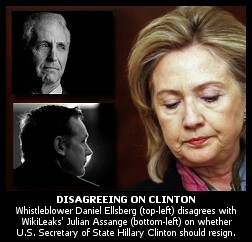 Unlike Assange, Ellsberg does not believe Hillary Clinton needs to resign. In an interview with TIME magazine earlier this week, in the wake of WikiLeaks' recent release of thousands of classified U.S. diplomatic cables, Assange responded to a question from managing editor Richard Stengel, saying that he felt the U.S. Secretary of State should step down. "She should resign if it can be shown that she was responsible for ordering U.S. diplomatic figures to engage in espionage in the United Nations, in violation of the international covenants to which the U.S. has signed up," Assange told TIME. "Yes, she should resign over that." But Ellsberg disagrees. During my on-air interview with him Wednesday, when I asked about that point and whether he agrees with Assange's assessment, he was direct in his response: "In a word, no," he told me. Despite information from the released cables --- in this case, revealing that the State Department, under the approval of Clinton, ordered U.S. diplomats to spy on their foreign counterparts by secretly collecting personal information such as credit card numbers, frequent flier membership records, email addresses, even fingerprints and DNA --- Ellsberg does not believe the disclosure, which he concedes reveals illegalities, merits her resignation. "I've come to respect Assange's judgment in a lot of these matters a lot more than I do the Pentagon spokespersons," Ellsberg said. "In this case, I don't agree with him." "In a way, I would have to say as a former insider here, he has far too idealistic and romantic a notion of what it means to be Secretary of State or a high official in the U.S. Government --- and really any government. Among the various illegalities, the various recklessness and so forth, shown by our policies, this one is indeed illegal, but it's not high on the list. Probably all countries do it to a large extent." Our interview touched on a broad range of points concerning Ellsberg's take on the leaks; his opinions about attacks on Assange; an explanation for his recent assertion that he'd "waited 40 years for a release of documents on this scale" in regard to the Iraq War log disclosures; his belief that the suspected leaker, Army intelligence analyst PFC Bradley Manning, is a "patriot" who did not commit treason under the law; and how the document dumps by Assange and WikiLeaks are both similar, and dissimilar, to those leaked by Ellsberg in the 70s when, as a military analyst for the U.S. Department of Defense, he leaked the "Pentagon Papers" to the New York Times and other media outlets revealing how the Johnson Administration had lied the U.S. into the Vietnam War. After we spoke on air, I followed up on a few points with Ellsberg off air. One of those points was in regard to his comments about Clinton, and his disagreement with Assange. While Ellsberg strongly condemns the Obama Administration for its failure to hold members of the Bush Administration accountable for "war crimes" and "torture" and for escalating a number of "aggressive wars" the U.S. continues to pursue, he reiterated that he doesn't believe the disclosures to date rise to serious enough crimes to merit Clinton's resignation. Ironically, perhaps, the White House seems to agree with Ellsberg, at least on the topic of Clinton, describing Assange's call for her resignation as "ridiculous." But that may be all that this White House and Ellsberg agree on. "Everybody involved in aggressive war in Iraq should be prosecuted as a war criminal," he said. "Obama didn't get us into Iraq or Aghanistan, though he certainly escalated it. But I'm not sure if it's criminal." He said that "not investigating torture [and] the failure to investigate it is illegal. Failure to hand over war criminals is illegal, but it's the responsibility of the Defense Department and the President," not the Secretary of State. Besides, "if Secretaries of State had to resign over illegalities," he told me, "we wouldn't have any of them serving for more than a few weeks." Audio of my December 1, 2010 interview Daniel Ellsberg on KPFK follows below. The text-transcript is now posted here. « PREVIOUS STORY "Brad Interviews 'Pentagon Papers' Whistleblower Daniel Ellsberg on WikiLeaks, Live Today on KPFK"
"Exclusive: Ellsberg Disagrees With WikiLeaks' Assange on Whether Clinton Should Resign"
There was an informative colloquy pertaining to the WikiLeaks cables between Carne Ross, a 15 year British diplomat who resigned prior to the Iraq war, Dan Ellsberg, Amy Goodman and others. Attorney Scott Horton agrees with Ellsberg on the Hillary Clinton issue. JULLIAN ASSANGE: She should resign, if it can be shown that she was responsible for ordering U.S. diplomatic figures to engage in espionage activity at the United Nations in violation of the international covenants to which the U.S. has signed up. Yes, she should resign over that. SCOTT HORTON: Well, that brings to mind that famous scene from Casablanca. "I am shocked—shocked—that they would do this." Of course, diplomats are not supposed to engage in espionage. On the other hand, of course, diplomats, one of their principal functions is collecting information and funneling it back to their government. And the division between collecting information and espionage is a slight and subtle distinction. So, frankly, no one who’s familiar with contemporary diplomatic practice was at all surprised by these cables or by the fact that the U.S. is collecting information or that it’s spying on United Nations officials. In fact, all these things have been reported in the press for many, many years. And grounds for resignation of a secretary of state, that strikes me as rather extreme. I mean, you know, frankly, we probably wouldn’t have many sitting foreign ministers or secretaries of state around the world if they all had to resign because they authorized the collection of such data. Am listening to your show with your interview with Daniel Ellsberg... Great show you did for those two days at KPFK... Thanks Brad.